I had this to say in 2010 - For those of you who follow David Hathaway's Solar Cycle forecasts, it is not looking good for Solar Cycle 25. Solar Cycle 25 is due to start about the end of 2020, nothing dramatic about that, apart from it WILL be lower in its Sunspot count then Solar Cycle 24, and boy oh boy how the numbers are starting to fall! 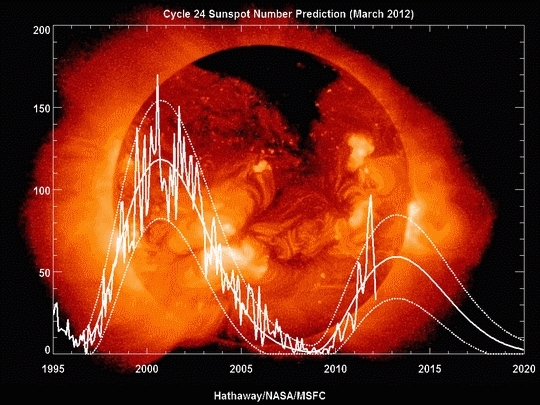 The current prediction for Sunspot Cycle 24 gives a smoothed sunspot number maximum of about 99 in February of 2013. We are currently about three years into Cycle 24. Increased activity in the last few months has raised the predicted maximum and moved it earlier in 2013. The current predicted size still make this the smallest sunspot cycle in over 80 years. Predicting the behavior of a sunspot cycle is fairly reliable once the cycle is well underway (about 3 years after the minimum in sunspot number occurs. The current prediction for Sunspot Cycle 24 gives a smoothed sunspot number maximum of about 69 in June of 2013. We are currently over two and a half years into Cycle 24. Three consecutive months with average daily sunspot numbers above 40 has raised the predicted maximum above the 64.2 for the Cycle 14 maximum in 1907. 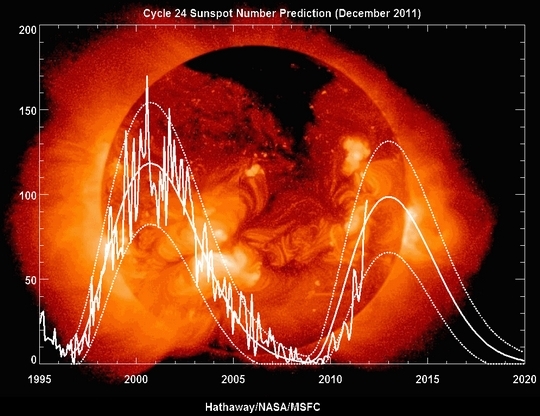 The predicted size would make this the smallest sunspot cycle in over 100 years. Because sunspot activity has historically predicted periods of global warming and global cooling – lots of sunspots translates into lots of warming and vice versa – Hathaway’s study – presented at a December 2006 meeting of the American Geophysical Union in San Francisco — acted to support global warming theorists and to discredit the various solar scientists who believe that Earth is about to enter a prolonged period of cooling. Today, Hathaway, a solar physicist at NASA’s Marshall Space Flight Center, believes his earlier prediction was wrong. Rather than hitting a peak of 160 sunspots, and possibly 185, as he predicted in 2006, he now believes that the Sun’s activity will decline dramatically. The current prediction, to less than half that of 2006, “would make this the smallest sunspot cycle in over 100 years,” he now states. A powerful explosion that erupted on the solar surface on February 14 was the most powerful flare in more than four years, and heralds an approaching peak in the sun’s 11-year activity cycle. But as the sun pulls out of an exceptionally quiet period of low activity, researchers predict the coming solar maximum won’t be very exciting either. “This cycle continues to fall below expectations. And those expectations were pretty low two years ago,” says David Hathaway of NASA’s Marshall Space Flight Center in Huntsville, Ala. The number of sunspots — dark, highly magnetized regions on the solar surface — is one indicator of solar activity, and scientists now predict this will be the weakest sunspot cycle in 200 years. “We are off to a good start for a below-average cycle peaking in late 2013 or early 2014,” says Dean Pesnell of NASA’s Goddard Space Flight Center in Greenbelt, Md. Understanding how present activity affects future cycles is important to gauging both the sun’s influence on climate and its likelihood of producing powerful and destructive solar storms. Solar physicists say they are homing in on the complex internal interactions that could explain why the sun has been hibernating for more than four years now and may not fully awaken for another decade. Hathaway and other researchers say they’re now convinced that a flow of ionized gas, or plasma, known as the meridional flow controls the strength of the solar cycle (SN: 4/10/11, p. 8).On either side of the equator, the flow moves like a conveyor belt that stretches just beneath the solar surface from the equator to the two poles and then dives into the sun’s interior, flowing from the poles back to the equator to complete the loop. Current prediction for the next sunspot cycle maximum gives a smoothed sunspot number maximum of about 59 in June/July of 2013. We are currently two years into Cycle 24 and the predicted size continues to fall. 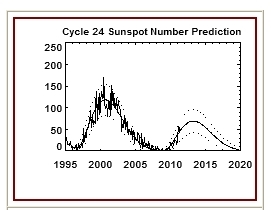 Current prediction for the next sunspot cycle maximum gives a smoothed sunspot number maximum of about 64 in June of 2013.